Goji berries. Those little shrivelled orangey red berries you bought at the health food store that were disappointingly bland. Remember them? You bought them because of something about them being a superfood…but then they languished in the cupboard and they were thrown out after the expiration date. Yes. That was my experience anyway. I really didn’t like them and proceeded to forget about them for the next six or seven years. Goji berries are also known as wolf berries and they originate in Tibet and China. The best wolf berries come from the Ningxia Province of China. They’re a member of the nightshade family, like tomatoes and aubergines, and they are considered a superfood because they are rich in antioxidants, as most berries are, and because of the generations-old traditional Chinese belief that eating them can lead to a long and healthy life. As with most natural products, the big pharmaceutical companies don’t want to invest their money in researching inexpensive and easily available food products, and so the research which has been done on the health benefits of goji has been sparse and of poor quality so far. In my internet travels, I found an online lecture which I took with a pinch of salt, as it was promoted by a particular brand of goji berry juice supplement, but unless they were out and out lying, the results were impressive. 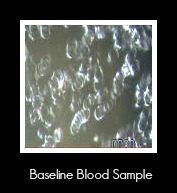 The lecturer shared sample blood work results for their produc t had done for an individual’s red blood cells. First they showed the baseline blood sample of the individual. The red blood cells were stacked and unhealthy with very little surface area. The video doesn’t go into it, but I should explain that in cytology, stacked red blood cells are called ‘rouleau’ and this happens as a result of various types of physical and/or mental stress which sends electrical currents through the body, forcing the cells to change their charge and stick together. In practical terms, this is what high blood pressure looks like. The lecturer then showed the second blood sample taken from the same individual, only 15 minutes after they had consumed 1oz their brand of goji berry juice supplement. 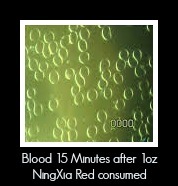 These red blood cells now appeared much healthier. Again, the lecturer didn’t cover this, but in cytology these would be called ‘normocytes’ which are the red blood cells of a healthy person. They have a dip in the middle, with lots of surface space to detox and they flow freely in the plasma because they are all negatively charged. I then went to the NHS website to see what they said and they pretty well pooh pooh’d the benefits of the goji berry. Not because they had any evidence that the goji berries did not do what the anecdotal evidence suggested, but because of the lack of solid scientific evidence in favour of them. Unfortunately, without serious financial investment, such evidence is unlikely to be researched and conventional medical websites like the NHS will continue to sing the same tune. However…when generations of a traditional culture have relied on a food for its health benefits…its usually for a good reason. And there is an awful lot of anecdotal evidence as well as the evidence from the small number of studies mentioned above which suggest that regular consumption of goji berries can improve diabetes*, high blood pressure* and age related macular degeneration. In particular, preliminary studies involving consumption of goji berry juice resulted in a feeling of well being and calmness, improved athletic performance and quality of sleep as well as weight loss. So, I guess I’m willing to play that gamble for the small expense of a few goji berries every day. The problem is that goji berries and goji juice…well, they don’t taste very nice. I had heard so many positive things about a particular brand of goji berry juice, that I ordered a couple of bottles and about a month ago I started taking a 50ml shot of it daily first thing after waking in the morning. At first it just tasted good and I didn’t notice anything special in how I felt. But after about a week of taking it daily, I found my energy levels significantly improved. I mean really really improved. I went from a constant state of lethargy and “I can’t keep up with this toddler” to feeling absolutely rested during the day, perfectly able to keep up with whatever is new in the world of my toddler, and I never have that ‘shattered’ feeling I had all the time before. I have so much energy. And I’m not sure why, but also an uncharacteristically optimistic and positive outlook on life…which I guess I can just describe as an overall sensation of ‘wellness’. Another result, which I was not at all expecting, but am nonetheless delighted by, is that I have lost about 10 pounds, despite no change in exercise or diet (aside from the addition of the goji juice). And the product I purchased** tasted delicious as it was blended with other antioxidant juices and had a tad of stevia added for sweetness. I suppose that after spending so many years being disappointed by so many supplements, vitamins, superfoods, eating trends and so on, in battling my general state of poor energy and fatigue, I’m a little surprised that I feel as good as I do just from one tiny glass of juice each morning. But I do. So I guess I should just be happy about that! I am seriously impressed by my experience with this goji berry juice and will continue taking it long term. I did have some slight concerns about the fact that goji berries are grown in China, but the company that made the supplement I have been taking is very aware of issues of toxicity with foods coming from China and their berries come strictly from the Ningxia Province which is very remote and is separated from the rest of China by a desert. In addition to this, they perform a metals test on every new batch of berries they receive. Goji berries from ANY other part of China are loaded with heavy metals, including mercury. *If you are taking drugs for either of these conditions, or if you are taking a blood thinning medication such as warfarin, please discuss taking any goji berry supplement with your doctor first, as it could interact with these prescriptions. **I bought this product at full price with my own money and have not been paid or otherwise compensated to review it. The results I describe are honest and based on my own experiences using this product. There are many goji berry products on the market, however, I cannot guarantee that they come from the Ningxia Province in China and are free of heavy metals. If you are interested in knowing the product I used, please follow this link. You can order it retail or set up your own wholesale account, in which case you may be asked for a ‘Sponsor or Enroller ID’. I’d be very grateful if you used mine, which is #3514264 and they’ll send me some sort of referral thank you. Disclaimer: This is not a sponsored post. I bought the product referred to with my own money and my comments are based on my own research and experience. The information presented on this website is for informational purposes only. The results reported may not necessarily occur in all individuals. Consult your physician, nutritionally oriented doctor, and/or chemist regarding any health problem and before using any supplements or before making any changes in prescribed medications. This entry was posted in Essential Oils & Natural Foods and tagged antioxidant, antioxidants, diabetes, diet, food, goji, goji berry, health, longevity, ningxia, NingXia Red, superfoods, weight loss, wolf berry, wolfberry on February 24, 2016 by Our Little Organic Life.